Lenses should be simple, protective, and enhancing. People lead different lives, and your vision is impacted differently by various activities – even by work, socialising and family time. Crizal UV offers unrivalled levels of durability, water repellence, dust repellence, smudge resistance and scratch resistance. They will provide you with clarity whilst protecting your eyes like no other anti-reflective lens. Cleaning your lenses will be a whole lot easier too. Multifocal lenses help people see clearly across all distances, without the need to switch glasses. An alternative to bifocals, they correct refractive errors like presbyopia. 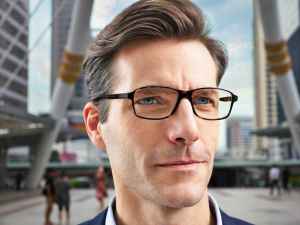 Progressive lenses provide a seamless graduation of lens strength. This avoids the jump in vision a wearer gets with bifocals, and actually trains the eye to improve vision. Discover five compelling reasons to take advantage of the leading innovations in the Lifestyle product range. Near or far, the Lifestyle range gives you clear vision whatever the distance. Whether at work with a computer, using a smartphone or tablet screen, or simply reading the news paper, the Lifestyle range provides total comfort. Great for sports and staying active, the Lifestyle range allow you to see perfectly – even in motion. Lenses are tailored to your visual behaviour. All Lifestyle Lenses are tested and approved by wearers to ensure your satisfaction, including fast and easy adaptation. With Lifestyle Lenses adaptation is guaranteed. If you are new to Lifestyle, try our training exercises to ensure you get the most out of your new varifocal lenses. Lifestyle Xclusive 4D is the best Lifestyle progressive lens allowing you to seamlessly capture every detail within arm’s reach with high precision, as well as beyond. You will enjoy outstanding sharpness, continuous vision and fluidity from near to far. Lifestyle® Xclusive 4D lenses dramatically reduces head movement so you don’t have to find the sweet spot. The performance of LifestyleXclusive 4D is enhanced by high tech personalisation parameters, including a brand new parameter called Near Vision Behaviour. Your optician will take a number of thorough measurements using a device called Visioffice. This state-of-the-art device will take 7 measurements to ensure that the lenses you wear are fully personalised to you, your posture and your visual behaviour. Your lenses will be unique to you and deliver the best visual experience. You will experience accelerated fluidity of vision within arm’s reach. Adaptation to your lenses will be very easy and quick.